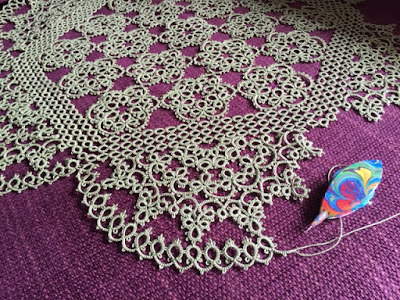 Here is the first of the rounds that make the whole circumference of the doily. Again, I decided to use unflipped reverse order stitches for the chains but I also thought I'd try something different to not have to refill my shuttles so often: I'm making the rings as SCMRs which means all the thread for the rings comes from the ball. I'm not 100% convinced I like this method yet but I've gone so far in this round that I will complete it and then decide what to do for the next. Ideally I'd like thread for both rings and chains to come from the ball and then you'd hardly need to refill. It's do-able and I've tried it on a little sample. You need to "cheat" a bit as after making a SCMR, the ball thread is not in the right place for making a chain next. I need to experiment further to see if the look is good enough with that method to pass the test. It seems a little bit more difficult to achieve very even, consistent SCMRs than it is with true rings but I don't think it's affecting the look too much overall. I had met a tatter who only used the SCMRs and all her thread came from the ball she told me-this was in my first year of tatting so I had no understanding to what she was saying, but I haven't really tried it. That's an interesting idea! I'm not sure I would have ever thought of using a SCMR, but I do like the idea of not having to refill my shuttles as frequently. It wouldn't t have occurred to me but what a clever idea! Are you doing a SLT to get the thread in the right place? Hi Michelle, I'm trying different things to try to get the best look. 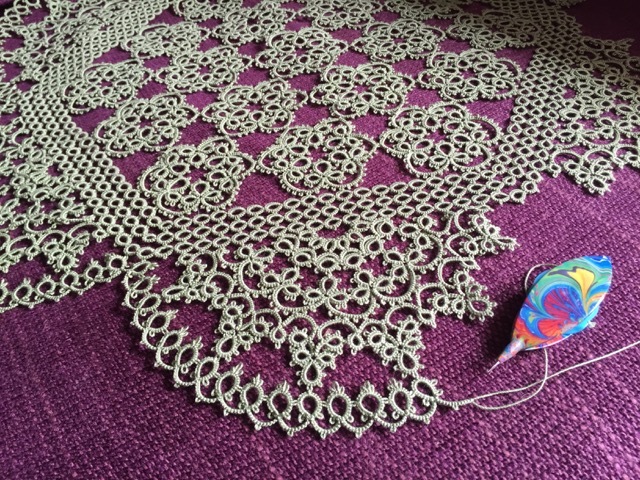 But I find that just carrying on tatting, without a SLT, also works. I used that method in my Mille-Fleurs pattern. Perhaps I'll show some comparison photos on my blog and we could all examine the differences. At one point in my tatting journey I finally realized that the beginning loop of an SCMR is for passing the shuttle through after tatting a 'chain', which forces the chain into a ring and locks it into place (the mock ring). This is similar to needle tatting where you tat chains all the time, but the chains are also made made into rings, as long as you remember to pass the needle through a loop after tatting all the required stitches for the ring. However, I do prefer to tat with a shuttle on smaller projects, so SCMRs are easy enough to do. Both methods enable you to work off the ball for ring-and-chain patterns, and as you noted, you don't have to worry about running out of thread on longer projects such as this! It looks like you are making perfect rings and chains here! You should be finished in no time! I hope you've seen my comment on your previous post about the interlocking split rings. Sometime when you get an opportunity, I think you'd be interested in seeing how to tat 'regular' interlocking rings with a shuttle. Comme c'est impressionnant! Un grand bravo. Bin gespannt auf Versuch mit SCMR-Ringe bei dieser Menge von Ringen . Ich habe die SMCR Ringe nur selten angewendet. In Mustern von Iris Niebach kommen sie vor. Sie sind am Anfang etwas gewöhnungsbedürftig, aber mit etwas Übung gelingen sie gut.